Art adds spice and variety to your life. Peaceful landscapes evoke memories of your family vacations. Elegant still lifes bring color and sophistication to your entry or office. Original works of art convey wonderful depth and richness in any setting. Many of you may be familiar with the Chicago cow exhibition. Artists took fiberglass cow sculptures and transformed them into works of art. After the cows were displayed along the sidewalks of Chicago, they were auctioned off. The incredible success inspired similar events across the country. 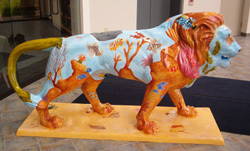 “The Pride of Oshkosh” featured fiberglass sculptures of Harris, one of two bronze lions guarding the Oshkosh Public Library. 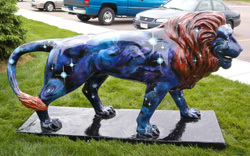 Local businesses paid to sponsor a lion and selected an artist’s design from a portfolio of submitted entries. For nearly four months, 33 lions roamed the streets, buildings, and parks of Oshkosh, Wisconsin. My two lions are quite different from each other. Inspired by a lifetime of stargazing, I designed “Leo’s Realm” to reflect astronomical wonders of the night sky. Nebulae, galaxies, and starbursts create a cosmic display of shape and color. A keen eye will spot Leo the constellation along the sculpture’s side. The base of the sculpture features constellations known in our northern skies. In “Ocean’s Pride”, the imposing and magnificent lionfish, resplendent in spiky fins, are masters of an ocean kingdom. Colorful corals and flowerlike anemones provide the backdrop to a lively gathering of oceanic wildlife. The base of the sculpture is a painted scene of the sandy ocean floor scattered with shells, starfish, stingrays, and other sea creatures. The lions were sold by auction in the autumn of 2004. Both "Leo's Realm" and "Ocean's Pride" were bought by individuals. Proceeds raised by the project went to the Oshkosh Public Library, the Oshkosh Area Community Foundation (arts grants), the University of Wisconsin Oshkosh Foundation (arts scholarships), and the Paine Art Center (artist residencies).